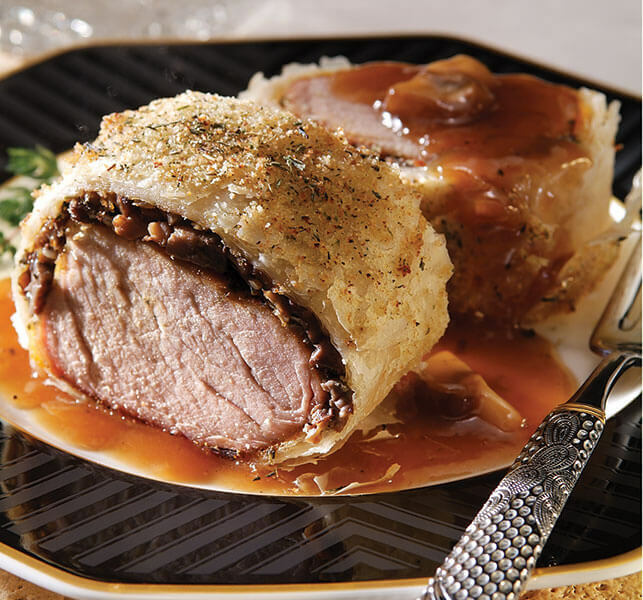 Add a flaky Phyllo crust and a flavor-boosting mushroom gravy to your next pork tenderloin with this recipe. In a medium skillet, melt 1 tablespoon butter and 1 tablespoon oil over medium heat. Add shallots and mushrooms; cook until mushrooms are tender, about 10 minutes. Remove from heat. Stir in the parsley and season with salt and pepper. Let mixture cool to room temperature. In a small bowl, thoroughly combine the garlic salt, thyme, oregano, and paprika. Rub the mixture over both sides of the pork. Put the pork in a roasting pan and bake in a preheated 3501/4F oven for 20 minutes, turning once. Remove pork from the pan and let cool for 10 minutes. In a small saucepan melt the remaining 2 tablespoons butter with 2 tablespoons oil. Layer 10 Phyllo sheets, brushing each sheet with the butter-oil mixture. Sprinkle 1 teaspoon breadcrumbs over each sheet as you layer them. Spread the mushroom mixture along one short edge of Phyllo, leaving a 2” border. Place pork tenderloin on top of the mushroom mixture, leaving a 2” border. Roll up from the short edge. Do not roll tightly, or strudel may split. Tuck or fold the edges at the ends to finish strudel. Place strudel seam-down on ungreased baking sheet and brush with butter-oil mixture and sprinkle with seasoned breadcrumbs. Score top into 6 equal sections. Bake in preheated 3501/4F oven for 30 minutes or until golden brown and an instant read thermometer registers 1551/4F. In a small saucepan, heat the mushroom gravy according to directions on jar. Remove strudel from the oven and let stand for 10 minutes before serving. Spoon gravy onto plate and place strudel on it. 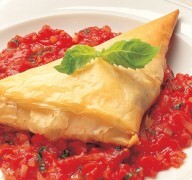 Two cheeses and an assortment of vegetables find a home in flaky Phyllo in these golden-brown triangles. 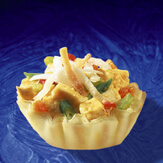 Featuring tender chicken simmered in coconut milk and flavored with a curry-powder-powered yogurt dressing, this Mini Phyllo Shell appetizer can lend an exotic flair to your next gathering.